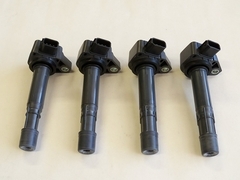 Set of 4 aftermarket K series ignition coils for use on B series engines with the Hondata CPR coil pack retrofit kit or the HondaRulez Coil on plug kit. 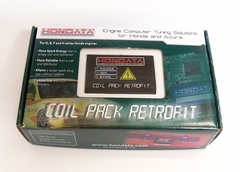 HondaRulez COP mini kit for OBD1 Civic/Integra ECU's. The HondaRulez Coil-on-plug kit is the solution for getting rid of the old distributor setup and installing an individual coil on plug or coil near plug setup. The ground-breaking feature of the HondaRulez kit over other COP kits is that this can be used in ANY OBD1 Civic/Integra ECU, even the stock ECU! Machined aluminum mounting plate for B series VTEC engines (B16A, B18C, etc.) 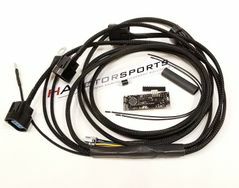 to mount K series ignition coils when using an individual coil on plug setup like the Hondata CPR or HondaRuleZ COP kit.